Would You Know What to Do After Someone Suffers a Concussion After a Bike Accident? 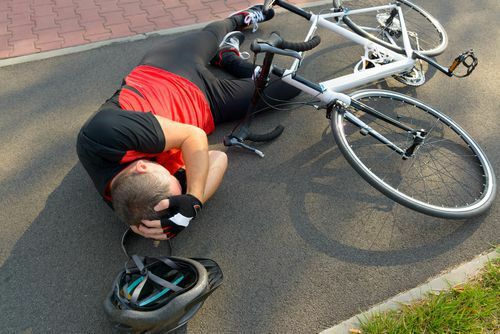 What to Do When Someone Suffers a Concussion in a Bike Crash It's important that we as cyclists understand and recognize the symptoms of a concussion after someone has been in a bike accident. Find out what you should do. Most serious riders would never get on their bike without a helmet. Any organized club ride will always make wearing a helmet mandatory. But, too many of us are uninformed on the risk and danger of suffering a concussion in a bike crash. Many believe wearing a helmet will protect against a concussion. The reality is the vast majority of helmets do nothing to prevent them. Many concussions are not recognized immediately and many of the symptoms will not appear for 24 hours or more. The good news is most concussions will resolve themselves without treatment within a week or two. The problem is when they initially occur, it isn’t possible to predict accurately whether someone has suffered a minor or a major concussion. Concussions must be taken seriously because symptoms may resolve within a short time but could also be life changing. Some in the medical world argue it is a mistake to try and label concussions as mild, moderate or severe. They say either you have a concussion or you don’t. Experts also point out the victim is the least likely to recognize the seriousness of what has happened. Those around them must know what to do. Common symptoms include nausea, headache, diminished motor skills, change in ability to see, smell or taste, dizziness, hypersensitivity to light or sound, shortened attention span or distraction, difficulty focusing or understanding directions, and difficulty with speech or finding the right word. The first course of action should be to stop the activity, get medical attention and rest until free of the symptoms. While most concussions will quickly resolve, many notable cyclists have required months or even years to recover. Recovery in serious cases may involve complete mental and physical rest - no work, no TV, no reading and sometimes even sitting in a completely darkened room. Jim Dodson is an experienced bike accident lawyer, cyclist and bicycle safety advocate who has been representing accident victims for over twenty-five years. He represents injury victims throughout Florida. He is the author of the Florida Bicycle Accident Handbook, relied upon by hundreds of cyclists across the state. If you have a question about a cycling accident, contact Jim online or call him directly at 888.815.6398. He has offices in Clearwater, Bradenton, Fort Myers, New Port Richey, Port Charolotte, Punta Gorda, Sanford, Sarasota, Tampa and Venice. There is never any charge to discuss your case.